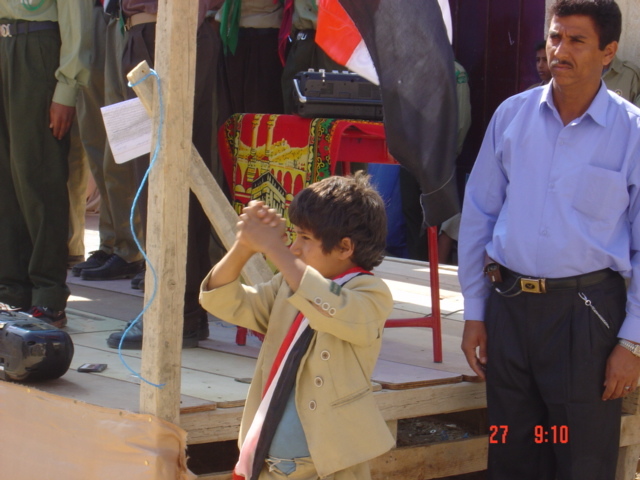 Over the course of the 2011 events, many schools in the Capital City and other governorates were damaged. Al-Rammah Girls Basic and Secondary School, in Al-Hasabah, Al-Thawrah District of the Capital City, was among those that were damaged. With over 120 teachers (male and female), the school previously operated a morning and evening shift, educating 1,700 female students. The school was vandalized and looted during the 2011 events, disrupting the students’ education. The Social Fund for Development (SFD) compiled a list of affected schools. In October 2012 SFD received a €7 million grant from the German Bank for Development (KfW) to rehabilitate, re-furnish and equip these schools to enable them to resume their normal functioning in the 2012/2013 academic year. The school administration, teachers, students, and parents praised SFD for its interventions and expressed their happiness and enthusiasm to return to school. One student, Alia’ Kamal, was reunited with her Al-Rammah School colleagues in early December 2012 and able to complete her education there among her life-long school classmates. Alia’ spent two months studying at a nearby school that had not suffered damages from the 2011 events, but reports that she feels more safe and reassured back at her original school. The school principal deems the current condition of the school as "excellent," and concludes: "We are at the end of December , with no other institution in the area fully open and naturally operating – with the exception of some schools, including ours ...”.